Film photography began with a mercury-silver amalgam, and ended with strips of nitrocellulose, silver iodide, and dyes. Along the way, there were some very odd chemistries going on in the world of photography, from ferric and silver salts to the prussian blue found in Cyanotypes and blueprints. Metal salts are fun, and for his Hackaday Prize entry, [David Brown] is building a printer for these alternative photographic processes. It’s not a dark room — it’s a laser printer designed to reproduce images with weird, strange chemistries. Cyanotypes are made by applying potassium ferricyanide and ferric ammonium citrate to some sort of medium, usually paper or cloth. This is then exposed via UV light (i.e. the sun), and whatever isn’t exposed is washed off. Instead of the sun, [David] is using a common UV laser diode to expose his photographs. he already has the mechanics of this printer designed, and he should be able to reach his goal of 750 dpi resolution and 8-bit monochrome. Digital photography will never go away, but there will always be a few people experimenting with light sensitive chemicals. We haven’t seen many people experiment with these strange alternative photographic processes, and anything that gets these really cool prints out into the world is great news for us. If you need a truly random event generator, just wait till your next rainstorm. Whether any given spot on the ground is hit by a drop at a particular time is anyone’s guess, and such randomness is key to this simple rig that estimates the value of pi using raindrop sensors. You may recall [AlphaPhoenix]’s recent electroshock Settlers of Catan expeditor. The idea with this less shocking build is to estimate the value of pi using the ratio of the area of a square sensor to a circular one. Simple piezo transducers serve as impact sensors that feed an Arduino and count the relative number of raindrops hitting the sensors. In the first video below, we see that as more data accumulates, the Arduino’s estimate of pi eventually converges on the well-known 3.14159 value. The second video has details of the math behind the method, plus a discussion of the real-world problems that cropped up during testing — turns out that waterproofing and grounding were both key to noise-free data from the sensor pads. In the end, [AlphaPhoenix] isn’t proving anything new, but we like the method here and can see applications for it. What about using such sensors to detect individual popcorn kernels popping to demonstrate the Gaussian distribution? We also can’t help but think of other ways to measure raindrops; how about strain gauges that weigh the rainwater as it accumulates differentially in square and circular containers? Share your ideas in the comments below. Almost every big corporation has a research and development organization, so it came as no surprise when we found a tip about Disney Research in the Hackaday Tip Line. And that the project in question turned out to involve human-safe haptic telepresence robots makes perfect sense, especially when your business is keeping the Happiest Place on Earth running smoothly. That Disney wants to make sure their Animatronics are safe is good news, but the Disney project is about more than keeping guests healthy. The video after the break and the accompanying paper (PDF link) describe a telepresence robot with a unique hydrostatic transmission coupling it to the operator. The actuators are based on a rolling-diaphragm design that limits hydraulic pressure. In a human-safe system that’s exactly what you want. The system is a hybrid hydraulic-pneumatic design; two actuators, one powered by water pressure and the other with air, oppose each other in each joint. The air-charged actuators behave like a mass-efficient spring that preloads the hydraulic actuator. This increases safety by allowing the system to be de-energized instantly by venting the air lines. What’s more, the whole system presents very low mechanical impedance, allowing haptic feedback to the operator through the system fluid. This provides enough sensitivity to handle an egg, thread a needle — or even bop a kid’s face with impunity. There are some great ideas here for robotics hackers, and you’ve got to admire the engineering that went into these actuators. For more research from the House of Mouse, check out this slightly creepy touch-sensitive smart watch, or this air-cannon haptic feedback generator. Do you always look at it encoded? – Well you have to. The image translators work for the construct program. Word clocks are supposed to de-encode time into a more readable format. Luckily [Xose Pérez] managed to recover the encoded time signal of the simulation we are all living in with his word clock that displays time using a stylish Matrix code animation. [Xose] already built his own versions of [Philippe Chrétien’s] Fibonacci Clock and [Jeremy Williams’s] Game Frame, and while doing so he designed a nice little PCB. It’s powered by an ATmega328p, features an RTC with backup battery, an SD-card socket, and it’s ready to drive a bunch of WS2812Bs aka NeoPixels. Since he still had a few spare copies of his design in stock, his new word clock is also driven by this board. [David Cook]’s summary below the write-up of his experiences working with a bismuth ingot is succinct. It’s a fair assessment of his time spent growing unspectacular bismuth crystals, casting a bismuth cylinder that cracked, and machining bismuth only to be left with a very rough finish. But even though he admits the exercise was unsuccessful, he does provide us with a fascinating look at the physical properties of the element. 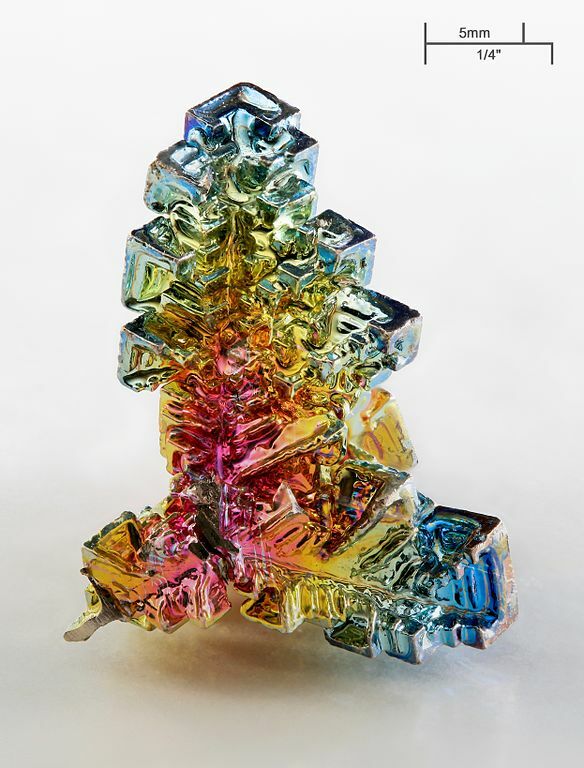 Bismuth is one of those elements you pass by in your school chemistry lessons, it has applications in machining alloys and as a lead replacement but most of us have never knowingly encountered it in the real world. It’s one of the heavy metals, below antimony and to the right of lead on the Periodic Table. Curious schoolchildren may have heard that like water it expands on solidifying or that it is diamagnetic, and most of us have probably seen spectacular pictures of its crystals coated in colourful iridescent oxides. It was a Hackaday story about these crystals that attracted [David] to the metal. It has a low enough melting point – 271.5 °C – that it can be liquified on a domestic stove, so mindful of his marital harmony should he destroy any kitchen appliances he bought a cheap electric ring from Amazon to go with his bismuth ingot. and set to work. His first discovery was that cheap electric rings outdoors aren’t very effective metallurgy furnaces. Relocating to the kitchen and risking spousal wrath, he did eventually melt his bismuth and pick off the top layer once it had resolidified, to reveal some crystals. These are the bismuth crystals he made. Unfortunately for him, instead of spectacular colors and huge crystals, the sight that greeted him was one of little brilliance. Small grey crystals with no iridescence. It seems the beautiful samples are made by a very slow cooling of the liquid bismuth, followed by a quick pouring off of the remaining molten metal. Future efforts, he assures us, will involve sand-insulated molds and careful temperature monitoring. Undeterred, he continued with his stock of bismuth and embarked on the creation of a cylinder. 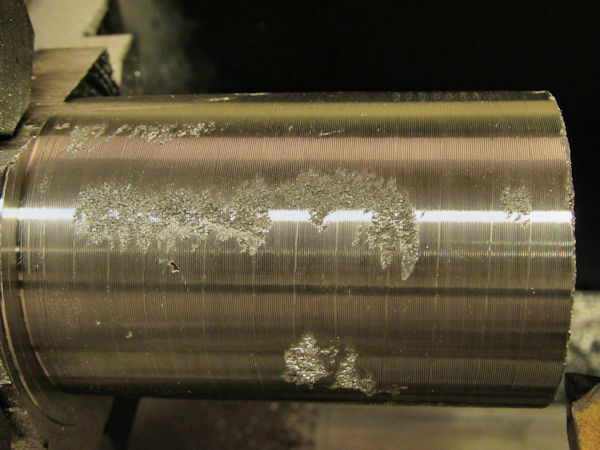 Early efforts with a clay mold resulted in cracked cylinders, so in desperation he cast the entirety of the metal in an aluminium baking tray and cut the resulting ingot to a rough piece of stock for turning. Poor finish on machined bismuth. With the bismuth in the lathe, he then came face to face with what he alluded to in his conclusion above, why machined bismuth parts aren’t something you’ll encounter. His cylinder came out with significantly rough patches on the surface, because bismuth is both crystalline and brittle. 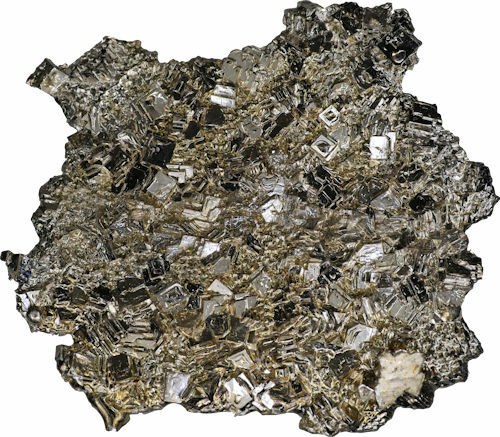 He suggests improvements could be made if the metal could be solidified with fewer crystals, but it’s obvious that elemental bismuth on its own is not a winner in the turning stakes. We suggest you take a look at [David]’s write-up. It may be presented as a Fail of The Week here, but in fact it’s more of a succession of experiments that didn’t work than an unmitigated disaster. The result is an interesting and well-documented read that we’re sure most Hackaday readers will gain something from. Aside from the bismuth crystals linked to above, we’ve featured bismuth a few times here at Hackaday. A low-temperature soldering process used it in an alloy, and we’ve even featured someone using it in another alloy to print using a RepRap. Thanks [nebk] for the tip. Fail of the Week is a Hackaday column which celebrates failure as a learning tool. Help keep the fun rolling by writing about your own failures and sending us a link to the story -- or sending in links to fail write ups you find in your Internet travels. In our final installment of Tools of the Trade (with respect to circuit board assembly), we’ll look at how the circuit board is tested and programmed. At this point in the process, the board has been fully assembled with both through hole and surface mount components, and it needs to be verified before shipping or putting it inside an enclosure. We may have already handled some of the verification step in an earlier episode on inspection of the board, but this step is testing the final PCB. Depending on scale, budget, and complexity, there are all kinds of ways to skin this cat. There’s no shortage of clock projects, but [niq_ro] has his own take using a vacuum fluorescent display (VFD), and Arduino, and a pair of MAX6921 ICs. Those chips are made to drive a VFD, and the use of two of the ICs required a bit of work. The Arduino is not a great time keeper, so the clock also uses a DS3231 clock module and a humidity and temperature sensor. The clock is in Romanian, although there are some options for different text. You can find the code on GitHub and can see the result in the video below.